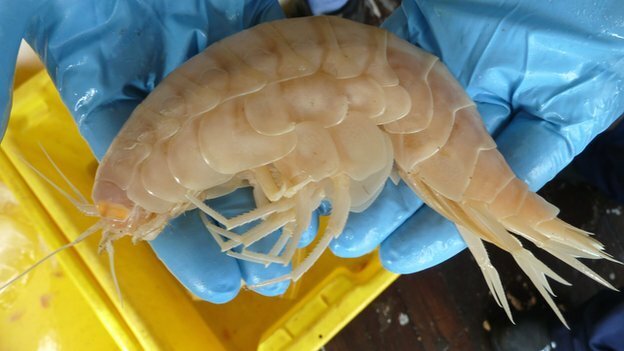 A “supergiant” crustacean has been found lurking 7 km down in the waters of the Kermadec Trench off New Zealand. The crustacean – called a supergiant – is a type of amphipod, which are normally around 2-3 cm long. These creatures were more than 10 times bigger: the largest found measured in at 34 cm. The strange beasts were found using a large metal trap, which had been equipped with a camera, housed in sapphire glass to keep it safe from the high pressures of the deep sea. The largest specimen brought back up to the ship measured 28cm in length, while the biggest spotted on camera was 34cm-long. Amphipods have been found living in large numbers at the very bottom of ocean trenches, deep, narrow valleys in the sea floor that can plunge down to nearly 11 km. The creatures are small, but extremely active, and seem to thrive in this place where the pressure is one thousand times greater than at sea level. The name “supergiant” was first coined after large specimens were caught in the 1980’s off the coast of Hawaii. They have been since being seen in the Antarctic, where they grew up to 10 cm, but these are now dwarfed by this latest find. Dr. Ashley Rowden, from Niwa, said: “It just goes to show that the more you look, the more you find. Over the last few years, scientists have been surprised by the life that is found in ocean trenches. These deep-sea spots were once thought to be barren; too dark, cold and with too much pressure for anything to survive. But researchers have found a wealth of life in the deepest of the deep. As well as swarms of amphipods, they have uncovered shrimp-like creatures called isopods and snailfish that live 7,700 m down.